Audi's first electric SUV will be based on the e-tron quattro concept, shown. It will challenge the Tesla Model X.
BERLIN -- Audi will aim for electric cars to account for a quarter of its sales by 2025 as part of a strategic overhaul following the emissions scandal at parent Volkswagen Group, company sources said, in a move that could step up the challenge to Tesla Motors. Audi, which has been slow to embrace battery-powered vehicles, will now invest about a third of its research and development budget into electric cars, digital services, and autonomous driving, two company sources told Reuters. Based on the 1.8 million cars sold by Audi last year, that would mean it selling at least 450,000 electric cars a year. Factoring in an expected rise in sales, that could turn Audi into a major competitor to Tesla, which believes it can sell 500,000 electric cars by 2020 or sooner. With the exception of BMW, Germany's luxury automakers have been late to develop electric vehicles, a market which is still money losing. But Audi's parent Volkswagen is under pressure to clean up its image in the wake of its emissions-test cheating scandal. Audi CEO Rupert Stadler plans to outline details of the new business roadmap to more than 2,000 managers on Wednesday at a closed-door conference in Munich, the sources said. An Audi spokesman declined to comment. German business daily Handelsblatt reported late on Monday about Audi's plans. Figures compiled for Reuters by LMC Automotive show BMW, Mercedes-Benz and Audi - the world's largest producers of luxury cars - rank 12th, 14th and 22nd respectively when it comes to annual sales of electric and hybrid vehicles, trailing Toyota, Honda, Lexus and Nissan. In the wake of Volkswagen's diesel test cheating, regulators around the world have intensified a clampdown on toxic fumes, potentially providing a boost in demand for zero emission cars. Customers have, however, been slow to adopt electric cars which have a limited operating range and long recharging times. Of the 14,202,024 new cars registered in the European Union and the European Free Trade Association last year, only 186,170 were electric vehicles and 234,170 were hybrids, figures from European auto association ACEA show. Year-to-date growth for electric vehicles has been slowing. While sales jumped by 55 percent last year, they have risen just 15 percent to 37,000 so far in 2016, according to JATO Dynamics. "Some governments in northern Europe where most of the electric vehicles are sold have announced fewer incentives. At the same time there hasn't been any important new launch in the electric vehicle segment," said Felipe Munoz, global automotive analyst with JATO. The lack of an electric SUV, and broad demand for hybrid vehicles, has dampened demand in pure electric cars, JATO said. To free up funds for the new strategy, Audi plans cutbacks in its conventional combustion car program including steps to reduce country-specific variants of engines and transmissions, the sources said, without being more specific. In 2015, Audi spent 4.24 billion euros ($4.69 billion) on r&d. Of the brand's 50 or so models, only two are electric or semi-electric and Audi is now taking orders on a third, the Q7 e-tron plug-in hybrid. 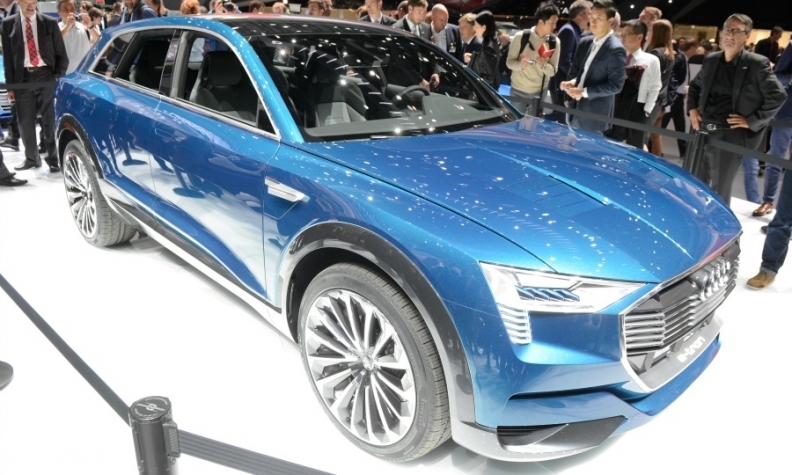 Audi's first electric SUV will be based on the e-tron quattro concept unveiled at the Frankfurt auto show last year. The electric SUV will challenge the Tesla Model X. It will fit between the Q5 midsize SUV and the Q7 large SUV and will likely be called the Q6. VW Group last month announced plans to spend billions of euros on electric cars, ride-hailing and automated driving to become a world leader in green transport by 2025.